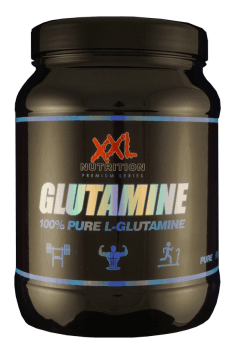 XXL Nutrition Glutamine is a high purity product containing 100% L-glutamine. It is an important amino acid that performs many functions in the body. Glutamine is the most commonly found amino acid in muscles - over 61% of skeletal muscle consists of glutamine. As glutamine is composed in 19% of nitrogen, it is the main transporter of this element to muscle tissue cells. The body naturally produces glutamine. It can also be found in many foods, but it is worth getting extra supplements to ensure the right amount of this amino acid in our body. The form of glutamine that we find in the presented product is L-glutamine, which is a building block for many proteins and also has many other functions, in contrast to D-glutamine, which seems to be relatively unimportant for living organisms. L-glutamine is an important component of body proteins, so people seeking to accelerate the growth of muscle mass and improve training results are interested in it. In one study, 31 people consumed glutamine or placebo during a 6-week period of a strength training. At the end of the study both groups showed an increase in strength and muscle mass. During an intense training, glutamine levels in the body decrease significantly, which has a negative effect on the strength, endurance and regeneration. It may take up to 6 days for glutamine to return to its normal level. Glutamine also plays an important role in the synthesis of proteins. According to research, it can help minimize muscle atrophy and improve protein metabolism. Additionally, it increases the volume of muscle cells and inhibits catabolism- the breakdown of muscle proteins. This is an interesting feature especially for people trying to get rid of excessive body fat without losing muscle mass. Some studies suggest that supplements containing glutamine may reduce muscle soreness and improve recovery after an intense workout. One of the experiments showed that glutamine, alone or in combination with carbohydrates, can help reduce the fatigue markers that appear in the blood during a two-hour run. Glutamine has also been used in an attempt to increase the activity of the immune system in athletes, but the results of these studies are ambiguous. Glutamine plays important functions in the immune system. It is an extremely important source of energy for cells in the immune system, including leukocytes and specific cells found in the intestines. The level of glutamine in the blood can be reduced by serious injuries, surgery or burns. If the body needs more glutamine than it is able to synthesise, it can lead to the breakdown of proteins stored in the body, including muscles, and the release of larger amounts of this amino acid. In the case of glutamine deficiency, also the function of the immune system may deteriorate. The effects of glutamine on the immune system is associated with many benefits for the digestive tract. The intestines are considered the largest part of the immune system in our body. This is due to the presence of many cells with immunological functions and trillions of bacteria living in the gastrointestinal tract. Glutamine is an extremely important source of energy for intestinal cells and the immune system. In addition, it supports the maintenance of the barrier between the intestinal lumen and the rest of the abdominal cavity and thus is a prevention of intestinal perforation. This prevents pathogenic bacteria and toxins from entering the body. In addition, glutamine plays an important role in the proper growth and supporting the intestinal cells. In summary, XXL Nutrition Glutamine is a high-quality supplement containing 100% L-glutamine. It supports the construction of muscle mass and can prevent the processes of muscle catabolism during weight loss. In addition, it is an important component of the immune system and helps to properly care for the health of the intestines. Glutamine also has a positive effect on regeneration, both after training and during convalescence after suffering injuries as a result of an accident or illness. Mix the portion of the product with 200 ml of water or juice and drink directly after training. It is recommended to use 5-10 g depending on the length and intensity of the physical effort. It is recommended to use about 5 g or slightly more L-glutamine per day. Higher doses may result in excessive accumulation of ammonium ions in the serum. Administration of glutamine as a food or intravenously was found to be helpful in reducing infection and promoting wound healing in people affected by burns, thereby shortening their stay in the hospital.